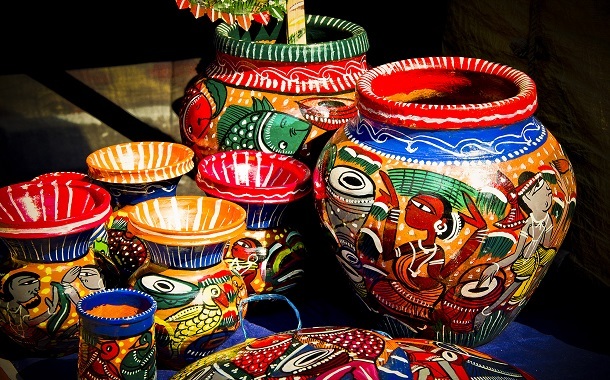 Handicrafts From Across India, Hand-made With Love! Remember the greeting card you made for your teacher on Teacher’s Day? It was full of imperfect flowers, and wrong spellings. But do you remember how your teacher smiled at you and accepted your card happily? That’s the beauty and the power of hand made things. Do you remember your first attempt at making a roti? It was half-cooked, and slightly burnt. But do you remember your parents enjoying every bite of your imperfect roti? That’s respect for your efforts. When we come together in a team, we all bring to the table our special skills that we’ve imbibed through our culture, and through our encounters in life. And it reflects greatly in our work. It defines us. Likewise, India has rich a culture and heritage in every corner, and it reflects gracefully in its works of art. But what adds beauty to it all, is that it is hand-made, and hand-made things are an outcome of lot of efforts and patience, and immense talent. Come along as I take you on a tour to explore the various handicrafts from across India. Chikankari is a traditional thread work from Lucknow. It has its origins dated back to the times of Nawab of Awadh Jahangir. Bandhani is a type of tying and using the dye technique. It has a significant place in Gujarat’s culture. The tribes of Rajasthan wear these traditional mirror work dresses, and it’s known for its intricate designs. The mirror work is evident in their culture, a good example of which is The Sheesh Mahal in Jaipur. Kerala, the land of coconuts, sure knows how to make the best use of its coconut residues. Coir is used in making a variety of things like door mats, ropes, mattresses, and creative craft works. Coir handicrafts are a beautiful combination of resource and skill. The Kashmiri carpets are beautiful beyond words. It is skillfully worked together by the talented locals and the carpets include intricate and elaborate designs. The Kancheepuram silk sarees also known as Kanjivaram sarees, are made in Tamil Nadu out of pure mulberry silk thread. The locals weave these sarees with beautiful designs and the final product looks stunning.